I've got a question for some of the other option traders out there regarding bookkeeping. In cases where you have shares put to you and then you go about selling calls or strangles around the position to reduce your cost basis do you still report it as option profits? Take my V.F. Corporation position that I entered via a put option that ended ITM. Since being put the shares I've since opened and closed 2 covered strangles for a net profit of $204.72. My question is what the proper way to report this would be. Essentially should I keep the original cost basis and report all of the options profits in the month they were received? Or should I reduce my cost basis and then not report the option profits? To me it doesn't seem correct to reduce my cost basis as well as report it as option profits? The way I've been doing things is to not reduce my cost basis and opt to report option profits instead. So despite earning another $204.72 via premium related to VFC I keep my cost basis at the original $53.50 and report the gains separately in the months they were locked in. It's not a huge difference either way, but to me it seems like it would be "double booking" the option profits to both reduce my cost basis as well as reporting them as gains. While just 7 moves might seem like a bit of a step down from double digit moves of the past few weeks this 7 number isn't truly accurate. The 7 represents the relatively simple and straight-forward moves that were made last week, but there were actually 10 others moves that require a bit more explanation and will have its own post coming out tomorrow or the next day. I was a bit more aggressive with opening this contract so I figured being a bit aggressive with closing it made sense. Especially since Lowe's (Stock Analysis) share price continued it's post earnings move higher allowing me to lock in a solid gain and reduce my exposure since this was a cash secured put. Essentially I valued freeing up that cash for other potential moves over collecting a little bit more in premium. 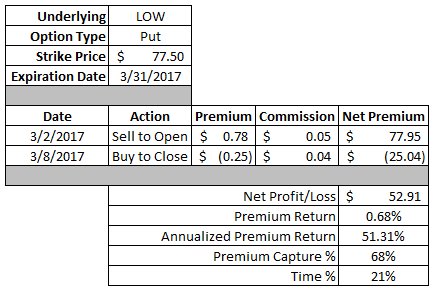 After closing the position for a debit I was able to net $52.91 of profit via the option premium. Based on the $7,750 of capital securing the contract that's a 0.68% return with an annualized return of 51.3%. I'd have preferred to just let this one go through until expiration, but Lowe's share price kept moving higher. As such I was able to capture 68% of the maximum profit in 21% of the time until expiration. If you've been following along in early/mid February I had a put option go awry on me with United Parcel Service having a big post earnings report decline. That led to me becoming a proud owner of 100 shares of UPS at an average cost basis of $113.24. Unfortunately the share price is still much lower around $106 so I've been selling covered strangles on the position to try and collect more premium. I wasn't thrilled with the covered strangle when I put it on because it was in the middle of me trying to figure out how to keep up the momentum with options while working nights. Unfortunately when this covered strangle was opened UPS' share price had a 1%+ decline and I would have changed my position, but it was filled by the time I checked on it later that day. Overall I'm happy to say that I was able to turn a profit on a sub-optimal covered strangle. The total profit worked out to $50.82 which is a 0.48% return on the additional $10,500 of capital in play. On an annualized basis that's a solid 11.7% return. I was only able to secure 34% of the maximum profit in 43% of the days until expiration. However, as you'll see next I opened up a new covered strangle position that I like a lot more than this one. The covered strangle might sound complicated, but in essence you're just stacking 2 conservative option strategies together. The covered strangle is made by owning 100 shares of stock and selling an OTM call option as well as an OTM put option. This allows you to set up a situation where you can reduce your cost basis, sell at a profit or collect a profit via the option premium. Of course you have to be willing to double down on your position which is the biggest drawback to the strategy. I'd have preferred to go with the regular April monthly expiration to collect more premium, but it was $5 wide strikes at the time and it just didn't set up right. If UPS' share price falls below $104 I'll have to purchase 100 more shares at an average cost basis of $103.04. That would be at a 3.3% discount to the current price and reduce my overall cost basis on the entire position to $108.14. If UPS' share price rises above $114 then I'll have to sell my current 100 shares at $114 plus the credit received from the option premium. My sale price would come to $114.96 and would net me a 1.52% gain on my original shares. From the time the contract was opened until expiration that would be a 17.6% annualized return. 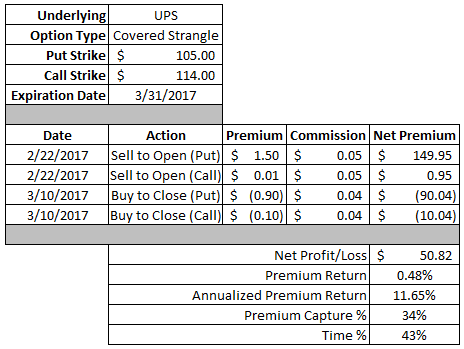 If UPS' share price just stays between the $104 strike of the put and the $114 strike of the call then both options would expire OTM and I would get to keep the full option premium as profit. 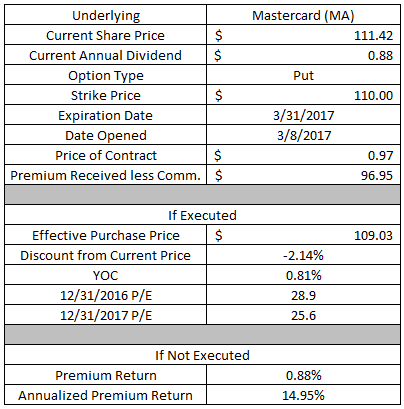 The $95.90 in option premium would be a 0.92% return on the additional $10,400 of capital in play or a 10.4% annualized return. Ideally the share price would just kind of meander slightly higher over the next couple weeks allowing time to just eat away at the price of the options. I'll be looking to close this position if I can close it out and lock in a 50% gain and then look to open a new covered strangle. V.F. Corporation is another one where I had the shares put to me via a put option expiring in the money. 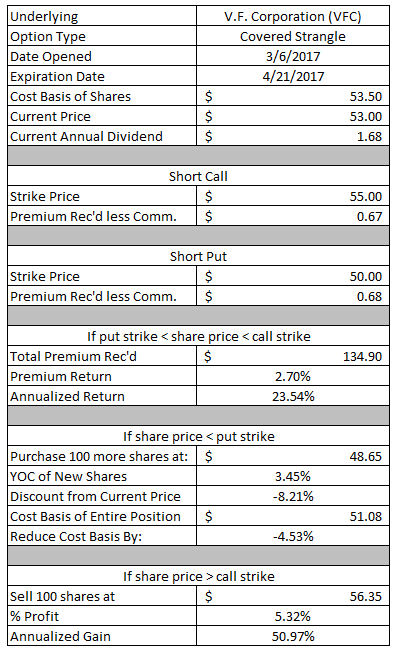 I own 100 shares of VFC at a per share cost basis of $53.50. I don't mind doubling up on my position in V.F. Corporation since I feel it's on of the cheaper dividend growth companies out there in the markets. If VFC's share price falls below the $50 strike of the put option I'll have to buy 100 more shares of VFC. My average cost basis on the new 100 shares would be $48.65 which is about 8.2% less than the current share price and would reduce my overall cost basis by 4.5% to $51.08. If VFC's share price rises above the $55 strike of the call option then I'll have to sell my existing 100 shares at the strike price plus the total premium received. My effective sale price would be $56.35 and would represent a 5.3% gain. From the date the contract was opened until expiration that would be a 51.0% annualized return. If VFC's share price remains between the strike of the put and call option then both contracts would expire out of the money and I would be able to collect the full option premium as profit. The $134.90 of option premium works out to a 2.70% return on the additional $5,000 of capital in play and would be a 23.5% annualized return. I'll likely look to close this position early if I can reach at least 50% of the maximum profit and then look to reestablish a new position for the following month. Nike (Stock Analysis) is a company that I've been using quite often over the past 6 months or so to generate option premium while setting myself up to purchase shares at a good long term price. Nike still has plenty of room for growth and with a low payout ratio I expect dividend growth to be able to be maintained at 10%+ on average each year. The week prior to this I had opened up a more aggressive put option against Nike, but since then the share price has declined. So I went with some preemptive adjustments by selling another put option to reduce my cost basis if both contracts end up in the money. If Nike's share price falls below the strike price of the put I'll have to purchase 100 shares for $54. However, the $55.95 of option premium would reduce my cost basis giving me an effective purchase price of $53.44. The valuation at that purchase price would be 24.7x on a trailing fiscal year basis, but a 22.8x level for the current fiscal year ending in May. If Nike's share price remains above the $54 strike then I'll get to keep the full option premium as profit. The $55.95 in option premium would be a 1.04% return on the $5,400 of capital to secure the contract. That would be a 24.8% annualized return through expiration. Since Nike is scheduled to report earnings on March 21st there likely won't be much room to do anything with this contract beforehand barring a huge move higher in the share price. Also with such little time after the earnings release until the expiration date of the contract I will likely look to just let this one expire unless the post earnings share price movement warrants any changes. I'm quite bullish on the two major payment processors of Visa and Mastercard. While I prefer Visa (Stock Analysis) over Mastercard, I also feel that Mastercard is trading at a better valuation. Plus I don't see any significant differences between the two companies so my option plays will essentially be based around the better relative value at the time. If Mastercard's share price falls below the $110 strike of the put then I'll have to purchase 100 shares at an effective purchase price of $109.03. My purchase price would be at a 2.1% discount to the current share price. That's not the best valuation at 28.9x on a trailing basis and 25.6x for the current fiscal year estimates; however, Mastercard is a company that can quickly outgrow a rich valuation. If Mastercard's share price remains above $110 then I'll get to keep the full $96.95 option premium as profit. That would be a 0.88% return on the $11,000 of capital to secure the contract or 15.0% annualized. Since Mastercard's next ex-div date is April 5, about a week after the expiration date I don't expect to make any moves to this contract unless Mastercard makes a decent move higher over the next 1-1.5 weeks. I'll likely let this one go until expiration and if the shares are put to me then I'll just look to sell call options to collect additional premium as well as the next dividend payment. From a business model perspective I really like the railroads. They essentially have built in monopolies and at worst duopolies in their markets because of the right of way for their tracks. Union Pacific is one of the best and is a company I'd like to build a long term position in...just at a lower price. If Union Pacific's share price falls below the $104 strike price then I'll have to purchase 100 shares at an effective cost basis of $103.21. That would be about a 3.0% discount from the current share price. The valuation at that level isn't great, but it's decent at 20.4x the trailing fiscal year earnings and 18.3x the current fiscal years estimates. 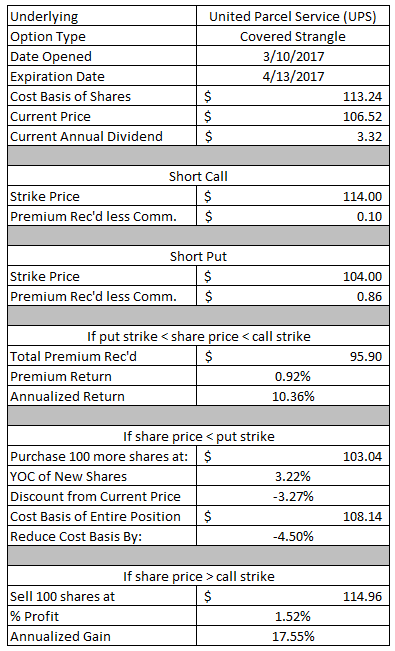 If Union Pacific's share price remains above $104 then I'll get to keep the $78.95 option premium as profit. 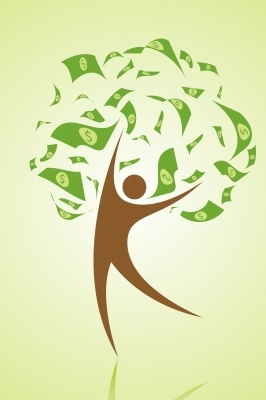 That would be a 0.76% return on the $10,400 of capital "at risk" or a 12.8% annualized return. March has seen a slow down in option premium profits with $445.39 booked through the first 2 weeks. Year to date I've generated a total of $3,602.51 in option income.